The soprano, Stefka Evstatieva, was born in Ruse on the 7 May 1947. 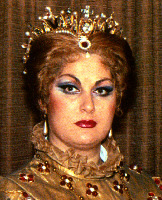 After vocal studies at the State Academy of Music in Sofia with Elena Kisselova, she began her career with the Ruse Opera where she sang from1971 to 1979. Her debut there was as Amelia in Un ballo in maschera. In 1974 Stefka Evstatieva won the second prize at the Tchaikovsky International competition in Moscow. (No first prize was awarded). In 1978 she won the Grand Prize of Belgian Radio & TV Belcanto Competition; in 1979 Grand Prize and Golden Ring in the Young Singers Competition in Sofia; and in 1982 the Best Performance Award at the Arena di Verona. After joining the Sofia National Opera in 1978, her international career developed at the Vienna State Opera in 1980, the Munich State Opera and the Royal Opera in 1981 and the Arena di Verona and La Scala in 1983. Additional engagements included Paris, Rome, Brussels, Buenos Ares, Berlin, Canada and Frankfurt. Her debut in the United States was singing Lisa in Pique Dame with the Philadelphia Opera in 1983, then followed performances in San Francisco and Dallas in 1984 and 1986, with additional engagements in New Orleans, Miami and Baltimore. At the Metropolitan Opera her debut was on April 9th, 1984 singing Elizabetta in Don Carlo. In addition to performing as a concert singer her major operatic roles included Aida, Donna Elvira, Desdemona, Leonora in Forza del Destino, Maddalena in Andrea Chenier, Elizabetta in Don Carlos, Amelia and the Russian roles of Lisa and Tatyana. Tchaikowsky: Pique Dame "Lisa's aria"